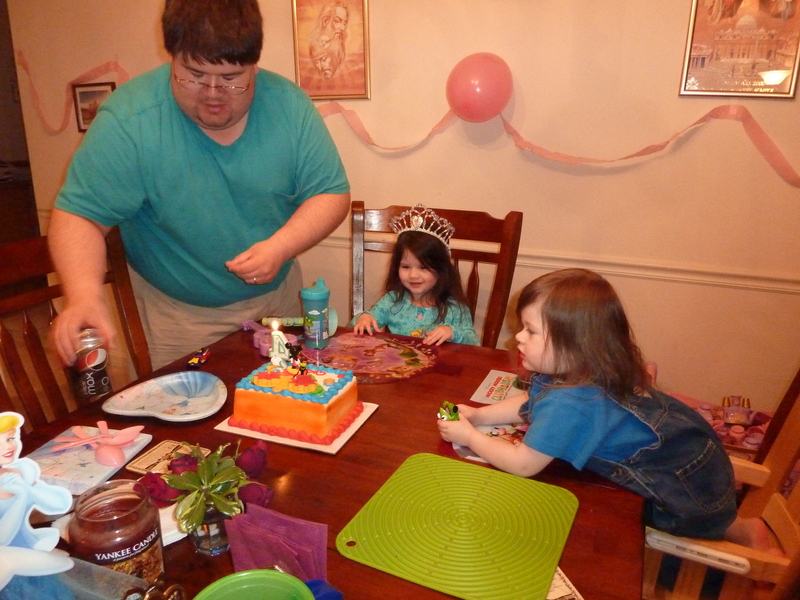 Having Left the Altar: Cecilia turns 4! 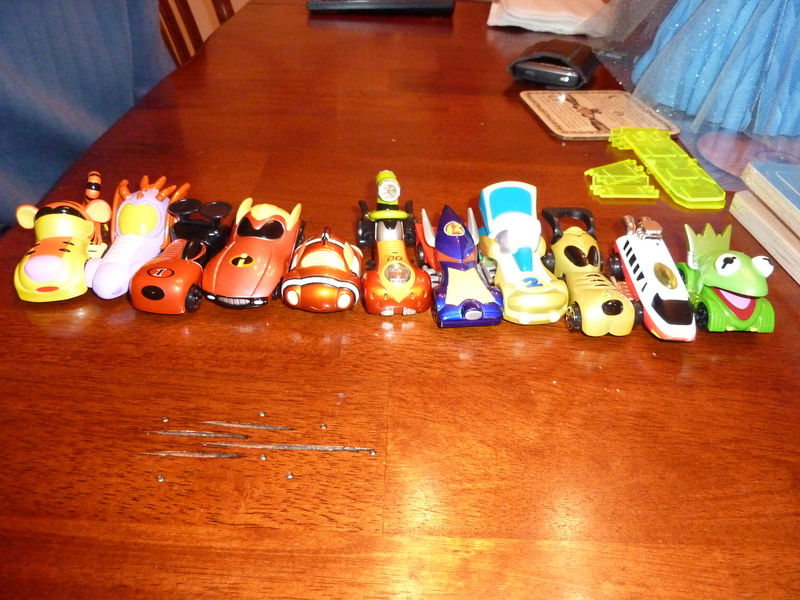 We've had a busy weekend. On Friday we took the girls to Chick Fila for lunch and then over an hour playing on their indoor playground. I love, love, love our Chick Fila. The restaurant is always clean and the staff is super nice. They bring the food to your table and come by to offer drink refills and I've even had them bring the girls balloons. 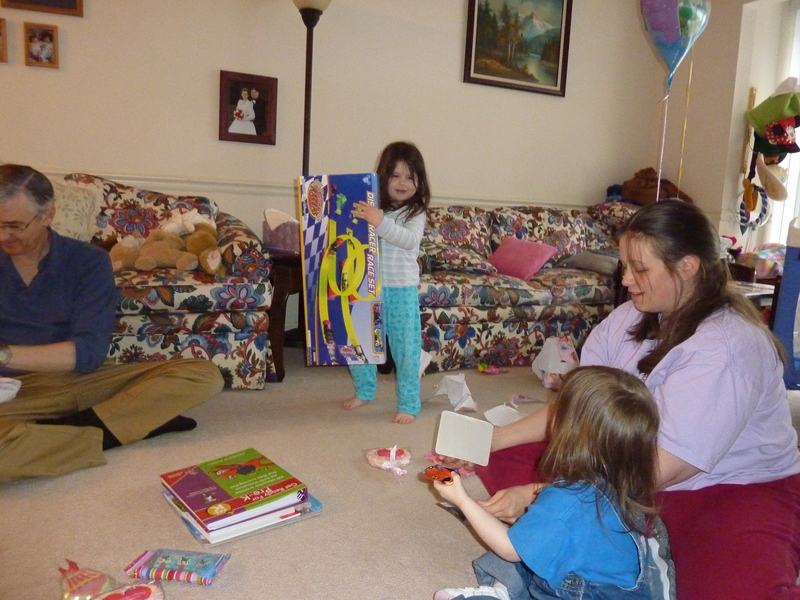 Then I took Cecilia (Felicity and Elizabeth were napping in the car while James supervised) for two carousel rides at the mall, a browse through the pet store (no, we didn't buy anything) and then a stop for a birthday card and wrapping paper. We then had dinner at Red Robin, which is another place Cecilia really likes. On Saturday we took the girls to see the Princess and the Frog, for the fourth and last time in theaters. It is a good film and Cecilia and Felicity behave well but Elizabeth, having learned how to crawl this past month, is not so keen anymore to just sit there and I had to leave the theater with her. Originally, the weather report for our area had been "little to no accumulation" but by the time we left the theater the roads were getting noticeably hazardous. It took us longer than usual to get home and we stayed in after that. 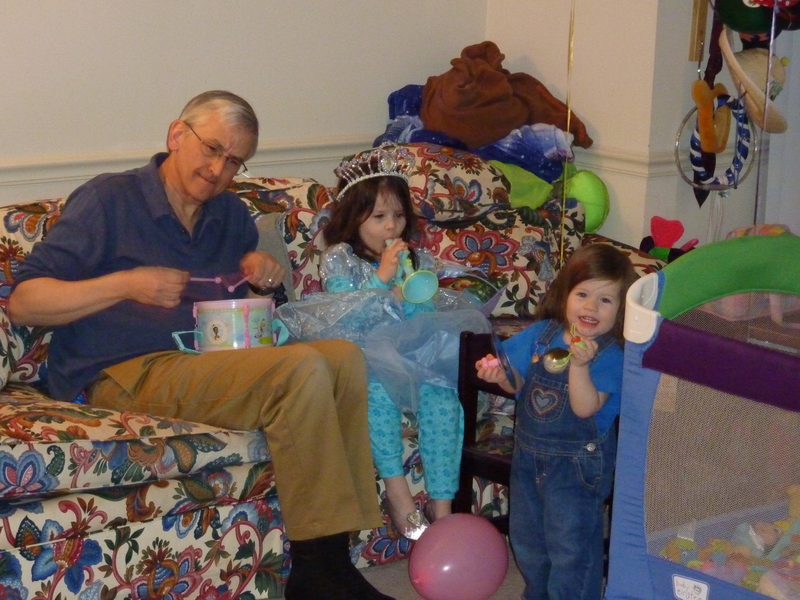 In fact, Cecilia's godparents were unable to make her party because of the weather. Our "little to no accumulation" turned into 6 inches of snow. Needless to say I don't think much of our weathermen right now. 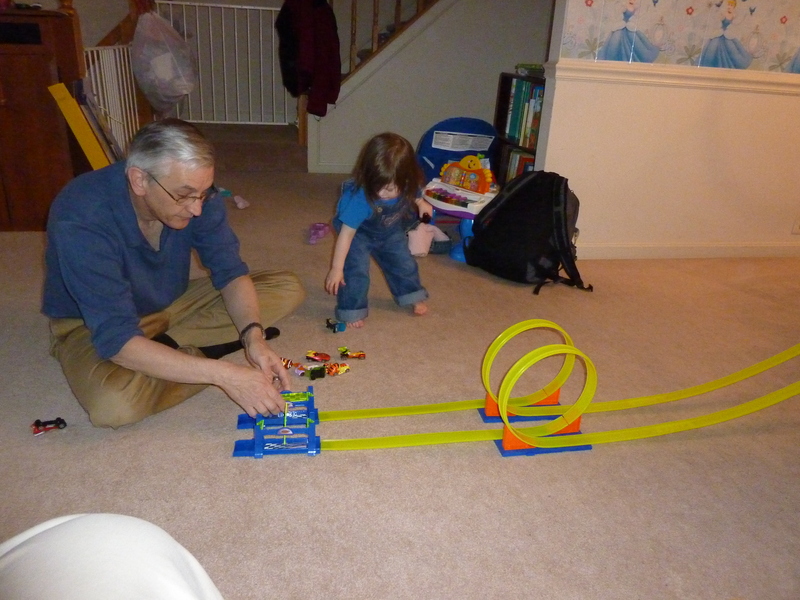 She had a blast racing Felicity with their new Disney character cars and race track. She got many wonderful new books! 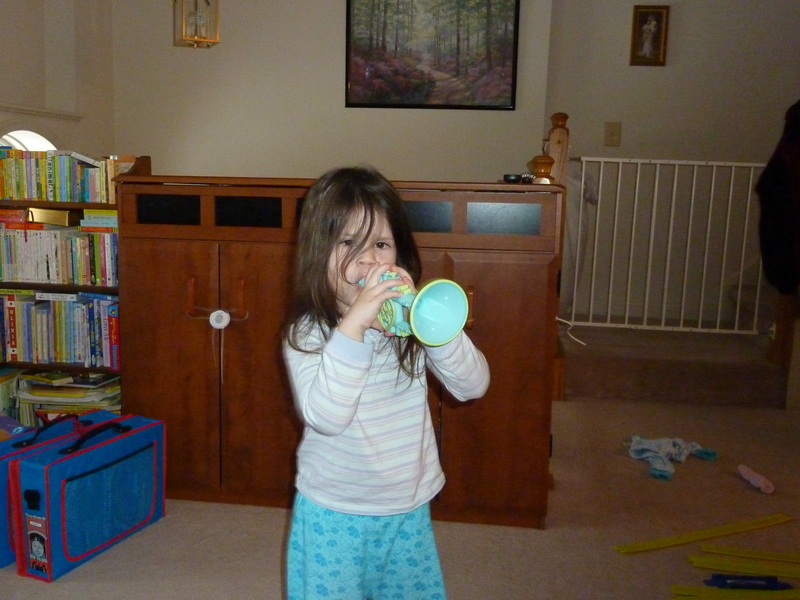 She had so much fun playing her new Princess and the Frog musical instruments. 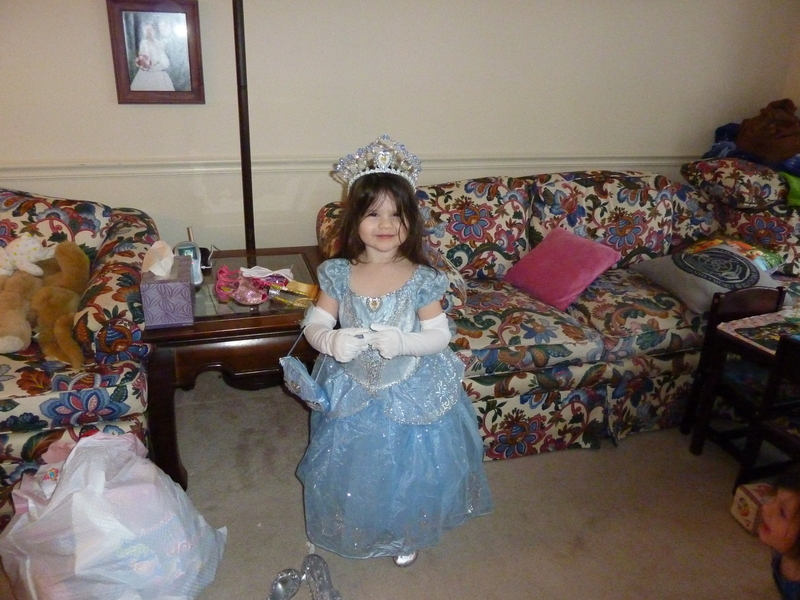 And she especially loved the Cinderella dress, slippers, gloves, purse and crown Grandma sent her. She wore it the rest of the day except when we made her take it off to eat. She is ready for the ball! Then we had a parade with dancing and music and became quite the party animals. Move over Ringo, Grandpa is on the drums now! Cecilia asked for an ice cream cake. So we got a Mickey themed chocolate ice cream cake from Baskin Robbins, which, I must say, was quite good. HAPPY 4TH BIRTHDAY MY BEAUTIFUL CECILIA!! !